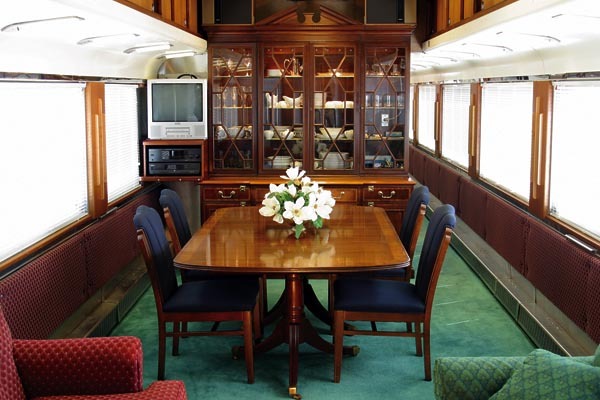 “Travel on the most comfortable ride on the rails!” We offer spacious bedrooms with plenty of storage. Two have a double bed. One master bedroom is available with your choice of 2 twin beds or 1 queen bed. All have marble and tile bathroom with shower, sink, and commode. Large dining/lounge area with oversize windows feels just like home. Exceptional culinary fare. Stereo, TV/VCR, DVD player. Based in Huntington WV. Pullman’s first all-stainless steel car, built in 1953 for service on MKT’s “Texas Special.” Totally rebuilt and reconfigured in 1989. 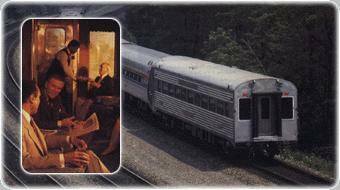 Chosen by Amtrak for experimental Keystone Classic Club service between New York and Pittsburgh.